This lab scenario will test your knowledge of all aspects of the CCNP Routing certification. And will require a broad perspective and knowledge base.I have also included a GNS3 basic configuration which you can download. You may also download the free solution for this lab but you must fires register there is no charge. Create seven loopback interfaces in R1 using the network range 133.33.16.0/24 to 133.33.23.0/24. Create seven loopback interface in R2 using the network range 133.33.24.0/24 to 133.33.31.0/24. Perform network summarization on these interfaces to reduce ip routing table size. Configure a static route to ensure that all loopbacks ranging from 133.16.0 to 133.33.31 are encompassed by a single static routing entry. In the section you will configure IGRP, EIGRP, and OSPF routing protocols across six of the nine routers. Configure IGRP on R5 E0 and E1 interfaces. Configure IGRP on the serial interface between R4 and R5. Ensure proper filtering is configured on R4 to send only networks that do not reside on R5. Configure the serial interface between R4 and R6 in EIGRP domain 1. Configure the VLAN 600 to reside in domain 1. Configure the serial interfaces between R1 and R2, R2 and R3, R1 and R3 to be in OSPF area 0.0.0.0. Configure the serial interfaces between R3 and R4 to be in OSPF area 350. Congure VLAN 100 to be in OSPF area 100. Configure VLAN 200 to be in OSPF area 200. Configure VLAN 300 to be in OSPF area 300. In the section you will redistribute IGRP, EIGRP, and OSPF routing protocols across six of the nine routers and verify IP connectivity to all routing domains. Ensure you can see distributed IGRP routes throughout the other protocols. Using the IOS passive-interface command, ensure that only the correct interfaces residing in the IGRP AS are configured to send and receive IGRP updates. Redistribute between EIGRP AS 1 and 2 and verify network connectivity. Verify IGRP and OSPF have these networks present in their IP routing Tables. Ensure the VLAN 600 and loopback interfaces on R6 OSPF cost metric are set to 1000. Configure R6 to set all external EIGRP routes in AS 1 with an administrative distance of 90. Redistribute OSPF into IGRP and EIGRP to maintain full network connectivity. Ensure that R3 is always the DR on the VLAN 300. Change the hello interval between R1 and R3 serial link to 25 seconds. Configure the local names of routers R1 to R6 so that all OSPF enabled routers can perform OSPF name lookup. Ensure the router ID on all OSPF enabled routers match the loopbacks. Configure area 200 as a stub area. Ensure the OSPF cost as seen by R1 and R3 for VLAN 200 is 1000. In this section of the exercise we will configure IBGP across your IGP network and minimize the number of IBGP peer sessions. R1 will be the focal point for all IBGP peering sessions and has two EBGP connections to the same ISP provided for redundancy. You will also configure BGP attributes to influence routing decisions made by the IBGP network and influence the path the ISP routers ISP1 and ISP2 choose. Use route reflectors and configure R1 as the route reflector to the route reflector clients R2, R3, R4, R5, and R6. Use BGP peer group on R1. Disable BGP synchronization on all IBGP routers. All IBGP routers should receive routing updates from R1. All IBGP connections must be active as long as the is active path between the routers. Router R1 has two EBGP connections to the same ISP multi homed. Configure EBGP between R1 AS-1 and ISP1 and ISP2 AS-1024. The routers ISP1 and ISP2 are both connected to AS-1024. Configure the following static routes to Null0 on ISP1 and ISP2. The ISP has provided you with the following next hop address and your local AS number. R1 serial interface S0/0 is 171.108.1.1/30 AS-1024. R1 serial interface S0/1 is 171.108.1.5/30 AS-1024. Configure EBGP on R1 and verify the all advertised routes from ISP1 and ISP2 are present in R1’s BGP table. All internet traffic sent to the default 0.0.0.0 is sent through R1. All ICMP traffic is sent through R2. All other traffic is sent through R1. Configure R1 to set the following attribute for networks from ISP1 and ISP2. Prepend all networks in the range of 1.0.0.0 to 9.0.0.0 with the AS Path 400, 300, 200 and the origin attribute incomplete. Set the weight of all networks received from ISP1 to 100 and ISP2 to 200. 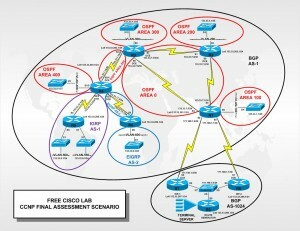 This completes theFree Cisco Lab CCNP final assessment scenario. How did you do. Wonderful website. Lots of useful info here. I’m sending it to several friends ans also sharing in delicious. And certainly, thanks for your effort!